We’d love your help. Let us know what’s wrong with this preview of Younger by the Day by Victoria Moran. Wouldn't it be wonderful to love your life through every age and stage of it? Appreciate yourself every step of the way? And have such vitality that, even though you're perfectly proud of the age you are, people routinely think you're several years younger? This happy state is the promise of Younger by the Day, a one - year program for aging in reverse with results that sta Wouldn't it be wonderful to love your life through every age and stage of it? Appreciate yourself every step of the way? And have such vitality that, even though you're perfectly proud of the age you are, people routinely think you're several years younger? This happy state is the promise of Younger by the Day, a one - year program for aging in reverse with results that start as soon as you do -- and you can start any day of the year. Victoria Moran was baffled when midlife seemed to change everything, from the shape of her body to her visibility in society. She began a four - year journey, asking these questions: Why do some women blossom with age while others wither? How can you accept yourself as you are and still nurture yourself into becoming the best you can be? How can you draw from your inner wisdom everything you need to deal with the un-certainties of life as well the certainty of growing older? To ask other readers questions about Younger by the Day, please sign up. Getting closer to 40 and while I refuse to freak out about it, I'm looking for examples of women who age gracefully, in spirit, but I'm not averse to seeking practical and easy advice for the physical side of things too. This book covers both. Lots of good advice here, some stuff I've heard before but bears hearing again (and again, and er, again), and some that is definitely not for me (an exclusively raw food diet, for example). 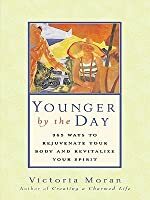 The author covers different aspects of aging: physical, emotional, Getting closer to 40 and while I refuse to freak out about it, I'm looking for examples of women who age gracefully, in spirit, but I'm not averse to seeking practical and easy advice for the physical side of things too. This book covers both. Lots of good advice here, some stuff I've heard before but bears hearing again (and again, and er, again), and some that is definitely not for me (an exclusively raw food diet, for example). The author covers different aspects of aging: physical, emotional, spiritual. I love everything about this book. 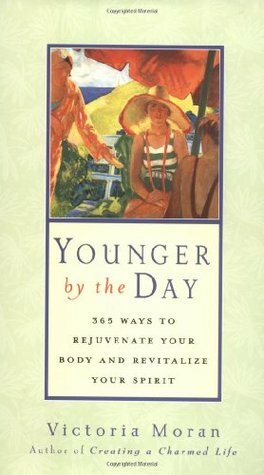 Even though I'm in my early thirties, and it is clearly addressed to a post-40 audience, we all deserve to know a wise, health-conscious elder woman, who tells us what to change in our lives today to live a healthier, painless (or less painful), and more content life in 10, 20, 30, maybe 40 years' time. And while I do have a mother and a friend who subtly educate me on these matters, sometimes a book - an all-round guide - is what it takes to change a habit, bu I love everything about this book. Even though I'm in my early thirties, and it is clearly addressed to a post-40 audience, we all deserve to know a wise, health-conscious elder woman, who tells us what to change in our lives today to live a healthier, painless (or less painful), and more content life in 10, 20, 30, maybe 40 years' time. And while I do have a mother and a friend who subtly educate me on these matters, sometimes a book - an all-round guide - is what it takes to change a habit, buy salad greens more often, and consciously try to seek pleasure and peace. This is another book that I have had for years. It is a daily informative, lovely book. It's a book to help you grow younger every day and do it gracefully. At the end of the year, I go right back to the beginning of the book and happily start all over again. I made it about half-way through this one before deciding it wasn't worth the effort. It's just not speaking to me right now. "Simple Abundance" is so much better—the author more likable, more depth to the content. This about the eighth or ninth time I have read this book. It gets better by the day. I didn't buy it, but because it is a one-day-at-a-time book, it would be helpful to own. But it is good. I really like her books. Inspiring and new perspectives. I borrowed this eBook. might have to buy this eBook since its a 1-year program for aging. Beginning my year-long journey. It will be so strange to have a book on my "currently reading" shelf for an entire year. I will try to update my review at the end of each month.